Hart plays Dell Scott, an ex-convict looking to land a steady job after getting out of prison. When he mistakes an interview for a caretaker position as a janitorial job, he finds himself in the penthouse of Phillip Lacasse (Bryan Cranston), a beleaguered author who’s lost all joy in life due to a paragliding accident that has left him a quadriplegic. Unlike all of the other candidates vying for the position, Phillip likes Dell because of his candid, outspoken nature and the fact that he’s not going out of his way to impress him. He just needs a signature that says he tried out the job and it didn’t work out. Phillip hires Dell on the spot to the chagrin of Yvonne Pendleton, a role Nicole Kidman was born to play, but one that’s also a bit of an enigma, as I’m not exactly sure what her role or title actually is. I believe they mention it in the film, but it’s pushed aside in favor of the more important bromance aspect of the film. She dictates his letters, keeps the house running, makes sure his employees are doing their jobs; essentially, she’s the perfect caretaker who doesn’t actually physically take care of the person she’s caring for. That’s where Dell comes in. The story as a whole is well-written and all of the performances create a sweet, caring and loving atmosphere that eases you into a relaxing, comfortable state of mind. The flow and the pace of the script are carefully crafted, and director Neil Burger does a fine job of mixing Hart’s comedic talents with the dramatic gravitas of Cranston, creating a respectful, symbiotic relationship that may carry a lot of conflict, but fuses the underlying essence of a man who needs to reignite his life after losing everything he’s held dear, including his wife, with that of a man looking to find a relationship with his estranged son (Jahi Di’Allo Winston). What happens, though, is that we become so settled into the story that by the time we reach the climax of the film, everything feels incredibly rushed and unprepared. It’s almost as if writer Jon Hartmere didn’t really know where to take the film. He was going along at a good clip, then noticed he was getting close to the 120 minute mark and had to do something to give the film a happy ending. Thus, all we’re left with after building up such a strong relationship are quick hints at where their lives are and where they may be in the future without letting us fully appreciate each man’s growth. Where the film does a terrific job, as mentioned, is the pairing of Hart and Cranston. Cranston, a bit of a comedian himself with prominent roles on Seinfeld and Malcolm in the Middle, has made a career as a powerhouse dramatic actor. His presence alone helps elevate Hart’s performance beyond the simple shtick we’ve seen him do a million times before. The dichotomy between the two men is in the strength of their resolve and how they relate to one another, helping the movie rise above the sometimes lewd comedy moments, made funnier by their placement in the film and the strength of the two actors’ performances. Adding in Kidman helps bridge the gap and form the bond that the two make. She does feel like a third wheel at times, however, she’s there to both support and keep in check these two men who have varying degrees of ideology. She loves and cares for Phillip in a way that neither can see and hates that Dell may be the lynchpin to both uplift and destroy the man she cares so deeply about. On the one hand, she knows Dell is the right person to help Phillip regain his spirit for life and adventure, and on the other she fears he may also open the door to a relationship she isn’t ready or willing to walk through. 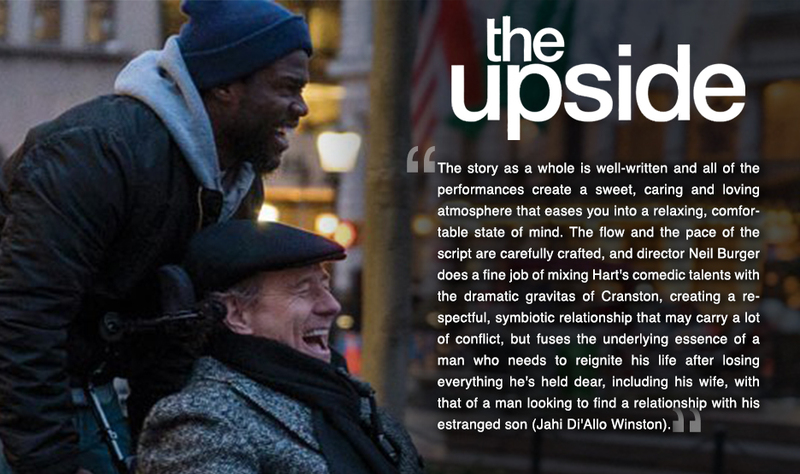 I can’t be completely sure if Kevin Hart will be able to transition from comedy to drama in the same way Carell or Hanks have been able to do, however, as long as he continues to appear in films with actors like Cranston (and avoids any further controversy in his personal life that may turn some viewers away), Hart should be able to find a steady workflow much like Williams had done, balancing comedic roles with dramatic ones to give him a long, fruitful career. Next week, new movies include Glass. If you would like to see a review of this, or any other film out next week, please respond in the comments below. This entry was posted on January 13, 2019, 6:49 pm and is filed under Entertainment, Film, Movies, Reviews. You can follow any responses to this entry through RSS 2.0. You can leave a response, or trackback from your own site.